P. b. baglafecht occurs in Eritrea and the Ethiopian Highlands (see light green on map). The breeding male has a yellow crown, greenish upperparts, and yellow below with a whitish belly. The breeding female is like the male, but the crown is greenish, and the mask is dull black with a green wash. Non-breeding birds have ashy upperparts. P. b. neumanni occurs in West Africa in Nigeria, Cameroon and Central African Republic (see yellow on map). It has brighter green upperparts than the nominate, a paler yellow forehead, and there is a non-breeding plumage. P. b. eremobius occurs in Sudan and DRCongo (see purple on map). It is smaller than the nominate, with more white below, and there is a non-breeding plumage. P. b. emini occurs in Sudan, Ethiopia and Uganda (see light blue on map). The breeding male has a yellow crown, but nape is black, with a grey rump. The breeding female has a black crown, and both sexes have a non-breeding plumage. P. b. stuhlmanni occurs in DRCongo, Uganda, Rwanda, Burundi and Tanzania (see orange on map). It has a black crown blending into the mask and the female has a duller cap. Both sexes have the nape and upperparts yellowish-green, and no seasonal change in plumage. P. b. reichenowi occurs in Uganda, Kenya and Tanzania (see dark green on map). 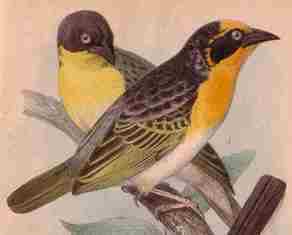 The male has a golden crown and yellow behind the ear-coverts, while the female has a black head. Both sexes have black upperparts, some yellow flecks on the rump, and no seasonal plumage change. P. b. sharpii occurs in Tanzania (see grey on map). It resembles stuhlmanni, but the breeding male has greener upperparts and paler yellow underparts, with no seasonal change in plumage. 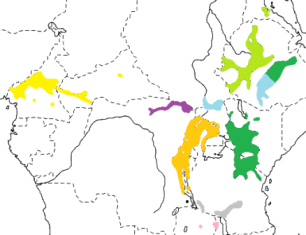 P. b. nyikae occurs on the Nyika Plateau in Zambia and Malawi (see pink on map). It is dark-capped, but the lower underparts are greyish, and there is a non-breeding plumage. 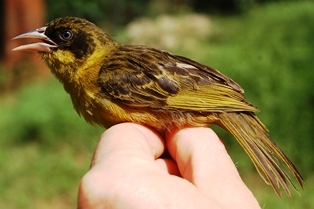 The Baglafecht Weaver inhabits forest clearings and open vegetation outside of forest, including gardens in cities. It is often found in small parties, otherwise singly or in pairs, but never in large flocks. 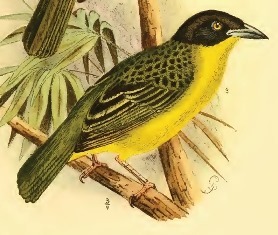 The Baglafecht Weaver feeds mainly on insects, and also on seeds and plant matter, including fruit. It feeds on nectar by dipping the bill into open flowers and swallowing droplets. The Baglafecht Weaver probes clusters of dry leaves, searching for insects, and gleans leaves and branches. The young are fed on spiders, moth larvae, grasshopper nymphs, small crickets, mantids, beetles, termite alates, and winged ants. 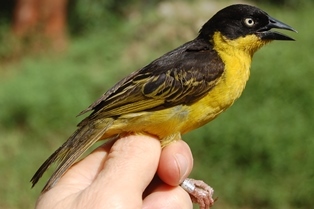 The Baglafecht Weaver is a monogamous, solitary nester. It is usually highly territorial, but sometimes two pairs nest in the same area. The nest is oval, without a spout, slightly flattened below, with the entrance well up one side, and an internal ledge to prevent eggs from falling out. The nest is thick-walled, and rather coarsely woven of strong strips of green grass blades or grass stems. The nest is lined by both sexes, using grass seedheads, feathers and plant down. The nest lining may project as a porch over the entrance. Nests are suspended below branches or palm fronds, and leaves are not stripped around nests, so that they are concealed. Successive nests may be built at the same site, so that several are present but only one is used for breeding, and the male may roost in an unlined nest. The female incubates the eggs. Initially only the female feeds young, but from about the 4th day the male helps feed. Few predators have been recorded, but monkeys have been seen raiding nests (read here). There are 40 PHOWN records for the Baglafecht Weaver (see PHOWN summary), but many more are needed of this common species. Submit any weaver nest records to PHOWN (PHOtos of Weaver Nests) via the Virtual Museum upload site.